Spyderco Native 5 40th Anniversary SPC41CF40TH Plain Edge. 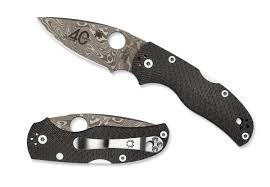 Spyderco has this knife to celebrate their Anniversary of 40 years. Spyderco started in 1976 and their knives are still being made in Golden Colorado, USA. This anniversary knife has a damascus blade on front and back. The handle has Titanium steel and a silver pocket clip, which can be switched from front to back. Do you own Spyderco Native 5 40th Anniversary SPC41CF40TH Plain Edge? Tell us about it! Have a question? Ask!